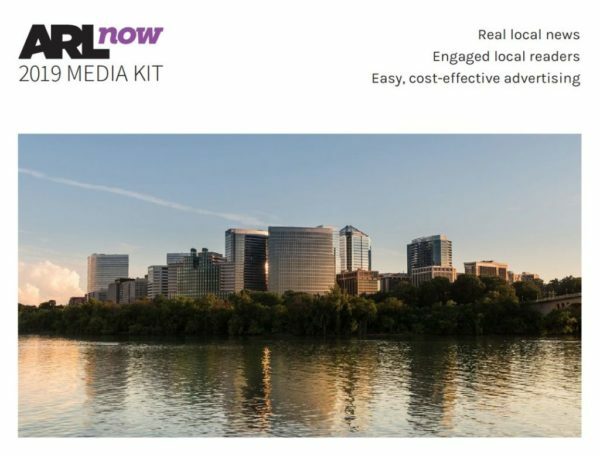 Founded in 2010, ARLnow.com is Arlington’s most-read and most-loved local news and lifestyle publication. Boasting a highly-engaged audience of about a quarter million monthly users, ARLnow is nationally-recognized as one of the country’s most successful and innovative online-only local news outlets. A 2018 Arlington County survey shows that ARLnow is the No. 1 source of local information for Arlington residents, above the Washington Post and the county government’s own website. Our goal is to make it as easy and affordable to achieve your local marketing goals as possible. Agencies and marketing departments: See our 2019 Media Kit for advertising and sponsored content options and pricing, then shoot us an email at [email protected] or give us a call at (703) 348-0583. Local businesses: let’s find the best solution for you. What kind of a campaign are you planning? Click on the most relevant link for recommendations. Have a need that isn’t listed above? Get in touch via the form below. If your budget is under $100, there are two self-serve options for you: post a Featured Event to promote a public event or submit a Community Post for publication on our homepage and in our email newsletter. Want to reach another valuable local audience? We also publish ALXnow (Alexandria), Reston Now (Reston and Herndon) and Tysons Reporter (Tysons, McLean, Vienna, Merrifield and Falls Church), and handle sales for PoPville (D.C.). Our team believes that great local advertising helps to supplement great local content. We work with advertisers to craft campaigns that are effective at reaching a large, local audience and achieving your marketing goals. Relevance: Communicate a value proposition that is genuinely of interest to your target audience. Authenticity: Emphasize your local connection and tell readers about yourself in a personal, authentic way. Actionability: Give highly-engaged readers a way to purchase, sign up or learn more. Brevity: Readers value their time, so keep it concise. Our advertisers are passionate about Arlington and enhancing the local community. And they’ve seen real, meaningful results with ARLnow. We’ve sold out events, filled patient schedules and helped home sellers get multiple offers. Want to learn more? Read a collection of client case studies and see a recent client list. The typical ARLnow reader is an affluent young professional between the age of 25-44, per Quantcast data and Google Analytics. But we also reach a wide range of locals, including military families, local government leaders and long-time Arlington residents. Top locations accessing site: Arlington, Va.; Washington, DC; Alexandria, Va.; Falls Church, Va.
Top non-ISP visitor domains: Arlington County government, DoD, DoS, DoJ, Microsoft, U.S. House of Representatives, FDIC, USPTO, U.S. Senate, Amazon. Want to work with us to achieve your marketing goals? Fill out the form above, drop us an email at [email protected] or give us a call (703) 348-0583. By the way, if you’re looking for a way to get in touch with the news staff, this is not it. Our news contact info is here.